Getting in the holiday mood was Heidi Montag and Spencer Pratt spotted with a pumpkin on a good time while he was out near their home in Los Angeles Thursday afternoon, twenty-eighth of October. 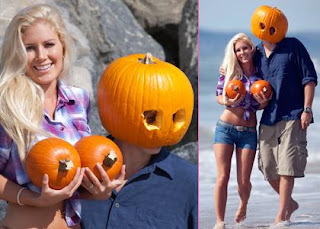 Ever outdoorsman, Spencer carved a face into his pumpkin with an army knife and put it over his head, while Heidi was half hearted attempt to hide the chest with two smaller pumpkins. During the day the picture up, took the former "Hills" lovers frolicking along the sandy beach, a rocky perch for a little PDA before heading back to the homefront. The trip comes just after Heidi's mother, Darlene Egelhoff, recently spoke to press about having to be a girl because of the economic downturn.